On September 3, Dean Peter Henry and Kim Schoenholtz, Professor of Management Practice in the Stern Economics Department and Director of the Center for Global Economy and Business, welcomed distinguished speakers and guests to the Fall 2013 Economic Outlook Forum. 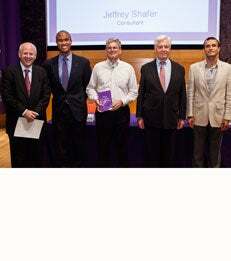 Professor Schoenholtz moderated a discussion on economic and market prospects among three leading economists. Ethan Harris, co-head of Global Economics Research at BofA Merrill Lynch Global Research, Thomas Philippon, John L. Vogelstein Faculty Fellow and Associate Professor of Finance at NYU Stern, and Jeffrey Shafer, consultant and former Under Secretary of the US Treasury, each made a brief presentation, followed by discussion and audience Q&A.